SC|CS16 Scholarship is now open! We sold t-shirts, asked for donations, held a scholarship drive, asked for more donations, sold more t-shirts, lesson plans, and other stuff and over the past year, I am proud to say we have raised the most money for this scholarship to date! Over 50 individuals and companies have helped to fund 8 scholarship applications (OK, so it is really 7 full scholarships and one that is 95% funded). 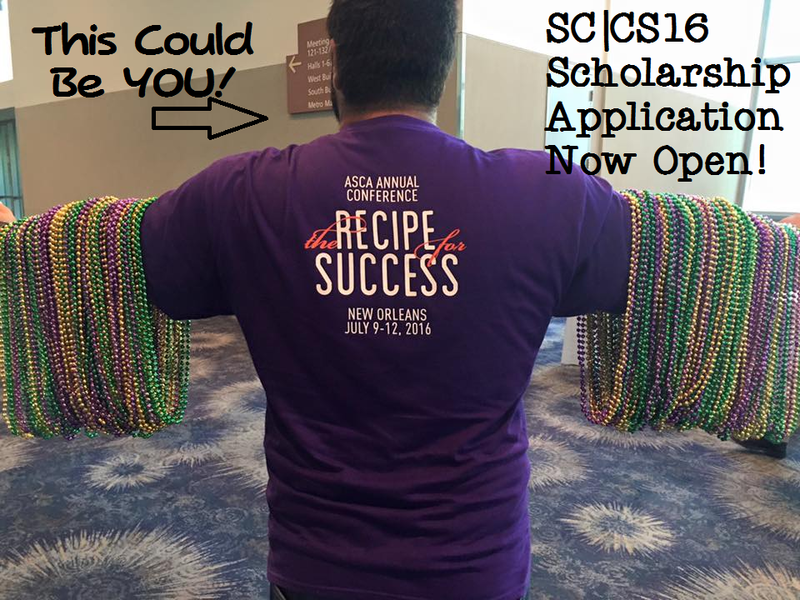 Each scholarship covers the cost of one ASCA Annual Conference conference fee of $369. Want to join Jeff Ream (The Counseling Geek) and I in New Orleans this July? Then you need to fill out this application! Please complete the following questions. Short answer: What are you most excited about learning at ASCA 2016? Short Answer: Why will attending ASCA 2016 help your students, school and/or community in particular? Using the SMART format - please create one (or more) goals that you will work towards meeting by attending ASCA 2016. You may also use the below link submission to share a document using Drive, Dropbox or Box.com if that is easier. If you do - please enter "See link" in this question. Specific:What will you or students do? Measurable:What data will you measure to know if you met your goal? Attainable/Action-Oriented:Is this "do-able"? How do you know? Realistic/Relevant:Is this goal worthwhile? How does it help us meet our other goals? Time-Bound:When will you meet this goal? Link to your submission. Please provide any additional details or notes that may be helpful when using or opening your submission. - Applicants must be credentialed school counselors or graduate students in a certified school counseling masters program to qualify. Need not be working full time to qualify. - Applicant roles will be verified before funds are distributed. - Recipients will be notified prior to the March 1st priority registration deadlines. Please plan on registering by that date. - We understand that life happens and plans change. If you receive a scholarship and are not able to attend - please contact Jeff or Carol. We ask that funds be donated back to the scholarship in this instance. - Only completed applications are considered. While we wish we can give a scholarship to each applicant - we have to select a few each year. If you apply and are not selected this year - please apply in future years. We try not to select past recipients (though you may apply each year) to give as many people a chance to attend ASCA as we can. Best of luck and thanks for being an awesome school counselor! Here are some compelling reasons to include this very important career statement in your resume and a top-10 tips list for writing a memorable one.